Oliver Ronald of Boss Design discusses how employee wellbeing is heavily influencing workplace design and office furniture specification. Many of us spend a large proportion of our lives in the office – up to 40 hours per week or more – and this can have a major impact on our work/life balance and wellbeing. This has led to the new thinking that a better work/life balance starts in the workplace. But how exactly do we define wellbeing in the workplace? As important as ‘wellness’ is, it actually goes way beyond this. It’s more a complex combination of the physical, psychological, social and relationship aspects of our working lives. It includes factors such as our working environment, processes and even how we get on with our manager and colleagues. One thing that’s for sure is that given the rising statistics for absenteeism due to anxiety or depression, workplace wellbeing is a serious issue, and the cost to a company due to poor employee wellbeing can be significant. In addition to lost productivity, there’s also added recruitment and training costs associated with a high turnover of staff. Quite simply, when we’re happy and healthy, we work better. However, while architects can’t be responsible for the overall culture of the organisation and how employees are treated, when designing the workplace they can help create an environment that employees can engage with and feel comfortable in. Ideally, this needs to be an environment that fosters creativity, collaboration, innovation, joyfulness, and thoughtfulness. The workplace is no longer a ‘one size fits all’ environment. The new workplace comprises a series of environments or ‘habitats’ that enable us to easily switch our mode of focus – be it concentrating, learning, socialising, or collaborating. By furnishing these habitats with appropriate furniture to support our various activities during the course of a day, not only will it enhance our wellbeing, it will lead to a more streamlined and connected workplace in which we all stay fulfilled and productive for longer periods. Typically, workplace habitats comprise of a ‘Welcome’ space that can double up as a reception or business lounge, a ‘Home’ habitat where we perform our work, and a ‘Collaboration’ habitat that helps drive communication and collaboration. In addition, the ‘Flow’ habitat offers primary paths through the workplace that provide plenty of opportunities for planned and unplanned exchanges, together with ‘Formal Meeting’ habitats. ‘Workcafe’ habitats are also key environments for working, socialising and refuelling. Office furniture has had to adapt significantly to accommodate new and modern methods of working. Instead of fixed desks that are ‘owned’ by individuals in the ‘Home’ habitat, we now have touchdown or breakout facilities where we can access the relevant tools and technology to perform our tasks. Such furniture provides an ergonomically sound alternative to sitting at a desk or a table, and can be either stand alone or grouped together to create flexible spaces for a modern workplace. This arrangement is also ideal for nomadic workers armed with laptops, tablets and mobile phones, enabling them to work anywhere, anytime. Lighting system that acts to change the colour and intensity of white light in the pod in accordance with people’s natural circadian rhythms, and to further promote wellbeing. While workplaces are trending towards open and flexible environments, it’s also important to remember the need for quiet, private spaces. 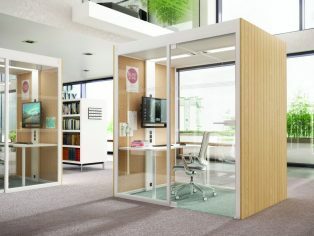 Telephone pods provide a much-needed place to concentrate and make private calls, encouraging creative and individual working – both vital for a more productive working environment and wellbeing. Good workplace design is no longer just about specifying furniture for the space available. By tearing down walls and introducing habitats, architects have significant freedom in designing an environment that can foster greater wellbeing for all. By specifying furniture that enables the collaborative sharing of new ideas and innovative thinking, as well as greater social interaction with our colleagues, our wellbeing and engagement will flourish while the company’s bottom line will prosper.